On October 7, as America marked ten years at war in Afghanistan, Tulsi Gabbard called for an immediate and safe withdrawal of American troops from Afghanistan. Gabbard, a veteran of two tours of duty in the Middle East, is a congressional candidate in Hawai’i’s second district. “Our country has now been at war in Afghanistan for 10 years. Over 1700 patriotic troops have lost their lives. Thousands more have been seriously wounded or lost their limbs. The question facing us is not whether we can afford to leave; it is ‘can we afford to stay?’ I say we cannot. 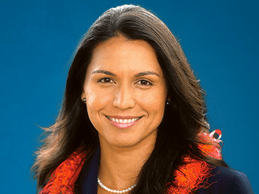 It is time to bring our troops home now,” said Gabbard, a captain in the Hawai’i National Guard. In her announcement, Gabbard pointed to the unclear mission in Afghanistan and the fact that taxpayer money spent in Afghanistan could be put to more effective use in the United States. “We achieved our original goal of entering Afghanistan. We’ve killed Bin Laden, decimated al-Qaeda in Afghanistan, and given the Afghan people the opportunity to have a democratic country if they choose. It is now time for the Afghan people to take responsibility for their own country,” said Gabbard. In 2004, as a member of the Hawai’i National Guard, Tulsi volunteered for deployment and served in Iraq for 18 months. She was awarded the Meritorious Service Medal for her service, and, in 2008, served a second tour of duty in the Middle East. Returning home, Tulsi was elected to the Honolulu City Council, remains a member of the Hawai’i National Guard, and was recently commissioned as a Captain. Submitted by Tulsi Gabbard. She is a member of the Hawai`i Army National Guard. Use of her military rank, job titles, images in uniform and her comments do not imply endorsement by the Department of the Army or the Department of Defense.